As many as 1,168 houses, factories and other buildings were waterlogged and over 70 residents were evacuated in Incheon and Gyeonggi Province due to heavy rain over the weekend, the nation’s disaster control center said Monday. In Incheon, where at least 100 millimeters of rain fell in an hour on Sunday morning, at least 2,000 public officials, fire fighters and volunteer workers were dispatched to help recovery operations, the city government said. 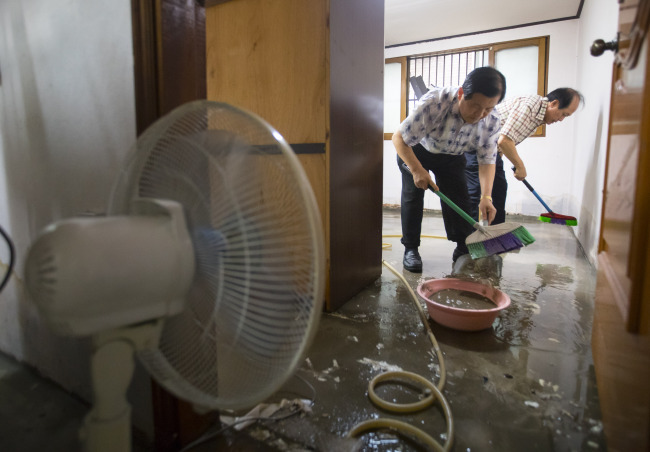 The Incheon Metropolitan City said it would provide flood victims with 1 million won ($895) for disaster relief per household, along with cleaning and drainage help. Along with the hardest-hit cities of Seoul and Incheon, cities in Gyeonggi Province received an average of 84.9 mm of rain from midnight Saturday to Monday 6 a.m.
Siheung, where 96 mm of rain fell on Sunday morning, had 126 houses and 23 hectares of farmland submerged in floodwaters. Residents were evacuated as 45 houses were waterlogged in Goyang, 32 houses in Ansan and 20 houses in Guri. As of Monday morning, Yeoncheon had received the most rainfall at 225.5 mm, followed by Pocheon at 202.5 mm, Goyang at 156.5 mm, Uiwang at 135.5 mm, Siheung at 128 mm and Gwangmyeong at 109 mm, according to the weather agency. All the cities are located in Gyeonggi Province. Although a heavy rain warning was lifted in rain-hit areas as rain subsided in Monday morning, the weather agency said up to 80 mm of rain was forecast to fall in parts of Gyeonggi Province until Tuesday. At least 30 mm of rain will pour down in southern parts of Gyeonggi Province and northern Chungcheong Province. Meanwhile, daytime highs will soar to 35 degrees Celsius in unaffected regions like South Jeolla and South Gyeongsang provinces. The southeastern city of Busan, which recorded a day high of 31 degrees Celsius Monday, was issued with a heat wave warning for the eighth day in a row.